PHILADELPHIA, PA – Wrestling fans gathered this morning at the Wells Fargo Arena and devoted there attention to the mosaic of red, black, blue, and gold as battle hardened grapplers took their turn upon the stage. The first round had its share of heartbreaks and exhilaration, and while some of our favorites fell, others unexpectedly triumphed. The team competition fell as expected with Penn State, Iowa, and Cornell finishing in the top 3 and competing for the top spot. Eight points separate the number 1, Penn State, with 20 points and number 10, Rutgers, with 12 points. While the first round is too early to pick a front runner, 5 teams have separated themselves from the rest with wrestlers still in the championship round: Penn State with 7, Iowa with 8, Cornell with 7, Wisconsin with 6, and Minnesota with 7. Among these top-5, the favorites will begin to emerge with more clarity. Steven Keith of Harvard narrowly defeats Shane Young (WVA) 1-0 and faces Anthony Robles (Az St) the number one seed. Steve Bonanno suffered a 5-2 loss to Ben Kjar (Utah). He will face Tyler Iwamura in the first round wrestle backs. Number 11 seed, Frank Perrelli of Cornell defeated Trent Sprenkle(NDSU). He meets Nicholas Bedelyon (Kent) next. Lou Ruggirello (Hofstra) added to his impressive pin states with first period fall over Demetrius Johnson(Chatt) at 0.57. He faces CAA finalist oponnent Kyle Hutter of ODU next. Matt Grey (Cornell) soundly defeated Garrett Drucker(ORST) 11-5. He meets Devin Carter of (Va. Tech). Ian Paddock(OSU) lost 16-8 to Devin Carter of (Va Tech) and wrestles Garrett Drucker (ORST) in the first round wrestle back. The New York alumni struggled through this round. Dutton(LEHI) lost 8-3 to number 5 seed Montell Marion(Iowa). Vicente Varella(Hof) lost 9-3 to Michael Mangnum (ORST). Andrew Alton pinned Anwar Gores (Bing) at 2:20. Dake(Cornell) wins 9-0 over Donnie COrby(CMich). He meets Torsten Gillespie(Edin), a NY alumni, in round 2. David Taylor (PSU) won in typical style with a MD (13-2) over Rober Erisman(OKST). He continues his undefeated red-shirt freshman season. Greisheimer won by fall at 4:31 demonstrating the tenacity that earned him 2 NY State titles. He faces the 2nd seed Steve Fittery (Amer) in round 2. Mack Lewnes(Corn) defeated Hunter Meys (Boston U) 7-2. Ryan Patrovich (HU) suffered a 5-2 loss to Luke Manuel(Purd). He faces Justin Zeerip(Mich) in the first round wrestle back. Ben Clymer (Hu) lost in overtime to Ryan Loder (UNI) 4-2. He faces the winner of Corey Peltier (MD) and Kirk Smith (Boise) in the first round wrestle back. Cam Simaz(Corn) defeats Ryan Smith (CPoly) 6-2. He faces Andy Johnson (Neb). 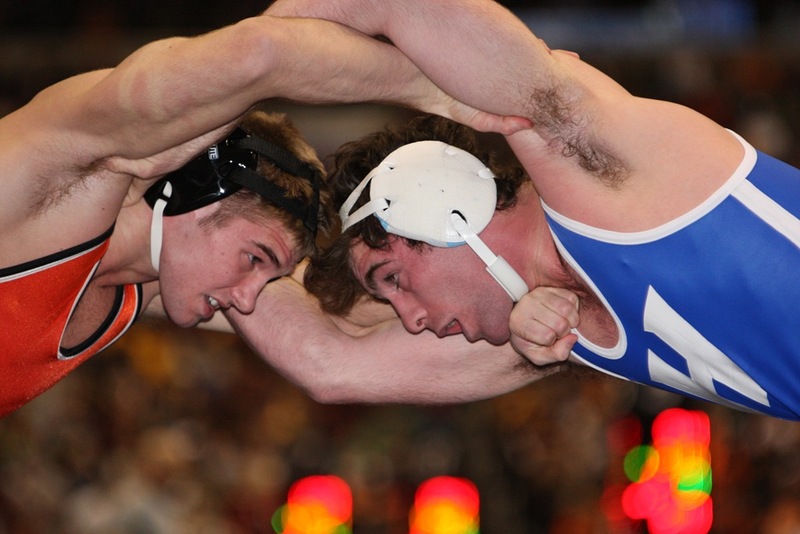 Paul Snyder(HU) suffered a 7-2 loss to Eric Bgenhagen(Wis) in the opening round. he will face J.T. Felix (Boise) next. What Long Island high school and only New York School ranks in the top 25 of the NCAA for having the most all-time All Americans? Submit your answer with a comment. Next Next post: What a Difference a Year Makes for the Pride?